Add some rustic country charm to your bathroom with Western bath decor. The variety of Western bath accessories available today is as big as the wild West itself. The final common element of Western decor is the Native American influence. Native American art and culture had a lot of influence in the Western lifestyle and is still part of the modern West. Western decor has a lot of natural colors, such as brown, black, tan, beige, turquoise and forest green. Textures resemble elements such as cowhide, tooled leather, wood, barbed wire and rawhide. All of these elements can be found in Western style bathroom accessories and decor. When it comes to rustic western furnishings, custom-made items are some of the most popular and sought after items on the market. Family owned companies such as Frontier Ironworks, hand make their western style home decor and offer you the option of having custom-made pieces. Frontier Ironworks makes towel bars, toilet paper holders and towel rings out of hammered metal and wrought iron. You can choose what finish you want for the metal and for the toilet paper holder and towel bar, you can choose the animal cut out that you prefer. Gary L. Russell is a rustic artist from Colorado that makes custom bathroom accessories out of steel plates. Gary cuts and shapes the metal using a hand torch. The heat from this torch also changes the color of the steel, creating a unique and interesting patina. You can see examples of Gary's custom Western bathroom accessories on his Art of Iron website, where you can also contact him to request your own unique bath accessories. In addition to rustic Western bathroom hardware, you can also find attractive Western bath towels, shower curtains and bath rugs. You can find many styles that have matching patterns for towels, shower curtains and bath rugs. Colors are usually warm, Earth tones like beige, tan, buckskin and brown. Some items, such as shower curtains, are made from a polyester microfiber suede material that resembles real leather. These shower curtains also have fringe at the bottom, adding an extra rustic element to their appearance. You can find Western style bath accessories that resemble real tooled leather. These items are actually made from a durable resin, so you don't have to worry about moisture and humidity. Another attractive style for bath accessories made from polyresin resembles the rough texture of old wood barrels. If you want to give your bathroom the aroma of natural leather, you can find candles and oils with this scent. 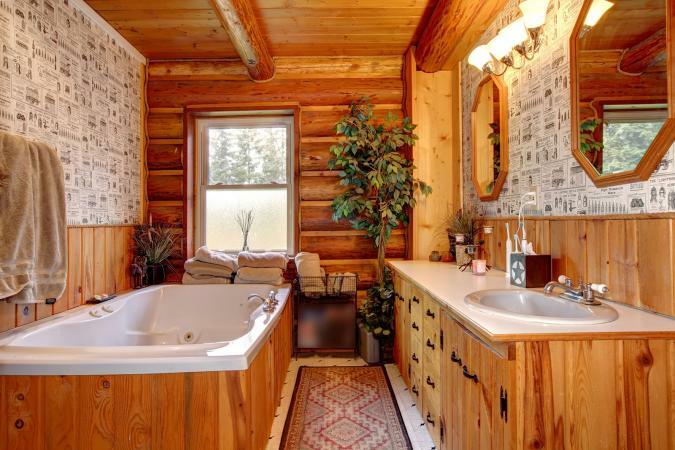 You don't have to be a cowboy, live on a ranch or live in a log home to appreciate Western style bathroom decor. All you need is a passion for the Western lifestyle.